This week I transcribe a newspaper article from September of 1911. It tells of a poker game disrupted by the police, and a great great uncle, Harry Feinstein, was among the charged. If you have an Amanuensis Monday post on your blog, please feel free to add a link below. An explanation of this weekly blog theme follows. Are you engaged in a transcription project of an historical document? This is what Amanuensis Monday was created for. Amanuensis is an obscure word, but it derives from the Latin, ‘Manu’ meaning ‘hand’. I began this project back in February of 2009, and since then, many others have joined in on the meme. Why do we transcribe? I provide my three reasons in the linked post. You may find others. A few weeks ago I mentioned that there was a likelihood I might soon be blogging about new surnames, as I delve into more research on my fiancée's ancestry. Well, it begins with a request for assistance in deciphering a given name on a death certificate. I know the name is Norwegian. My first guess is Erikson Olson, though I am unsure how common a surname as a given name is in Norwegian tradition. Update : I'm fairly certain I just found the death certificate for the brother of the individual's above, and the father's name is recorded as Eric Olson, so I suspect my first instinct was correct. Though it is unclear which son communicated the correct name to his family. The other son's family says the father was born in Sweden. One of them is likely correct. It was nice of both brothers to move to Missouri which has a useful online database of death certificates. This week I transcribe a letter my grandfather, Martin Deutsch, received from his brother, Ed, in 1944. The letter is more about their brother, Jerry, and his entrance into WWII. The Newmark men filed Declarations of their Intention to Naturalize in 1910. Early in my research, I found copies of their declarations in the microfilm section of the St. Louis County Library. The Declaration of Intent is sometimes referred to as "First Papers." A petition, or "Second Papers" followed. Philip Trauring at Blood and Frogs: Jewish Genealogy and More recently posted a primer on Naturalization records, including an index of National Archives holdings by state and year. Since the National Archives indicates that they usually have "Second Papers" and occasionally have "First Papers" in addition, I jumped at the chance to request a copy of my great great grandfather, Samuel Newmark's records, in order to get a glance at the petition. The turn around was very quick. I placed the order on Monday, April 11, and I received the CD containing the scanned document this weekend. Under 7 days. Alas, all it contained was the Declaration of Intent. I noted my disappointment in a comment on the Blood and Frogs site, and Philip asked me a question I should have already asked myself. "Do you know for sure that your ancestor actually completed the Naturalization process?" No, I wasn't sure. I checked the 1920 and 1930 census, and lo and behold, under the Naturalization column for Samuel Newmark is the code, "AL." Which stands for "Alien." This actually explains a lot, as I was confused why Samuel's youngest son, Israel, filed a Declaration of Intent in 1922, when surely he was naturalized when his father went through the process. If Samuel didn't complete the process, Israel had to go through it on his own when he turned 18. So now I have ordered the records for my great grandfather, Barney Newmark. The 1920 and 1930 census indicate he completed the process. I don't actually expect to learn new information. I am curious what he put down as his date of birth, as that seems to change from record to record. I'm also interested in whether he was still living at the same address as when he filed the Declaration of Intent. This week I transcribe a letter my grandfather, Martin Deutsch, received from his civil employer a few months after he entered military service in 1942. My grandfather was a Postal Inspector, and during the war helped to set up and run several APOs. April 6th is National Tartan Day in the US. - "The National Holiday for all Scottish Americans"
To be clear, April 6th is Tartan Day everywhere. 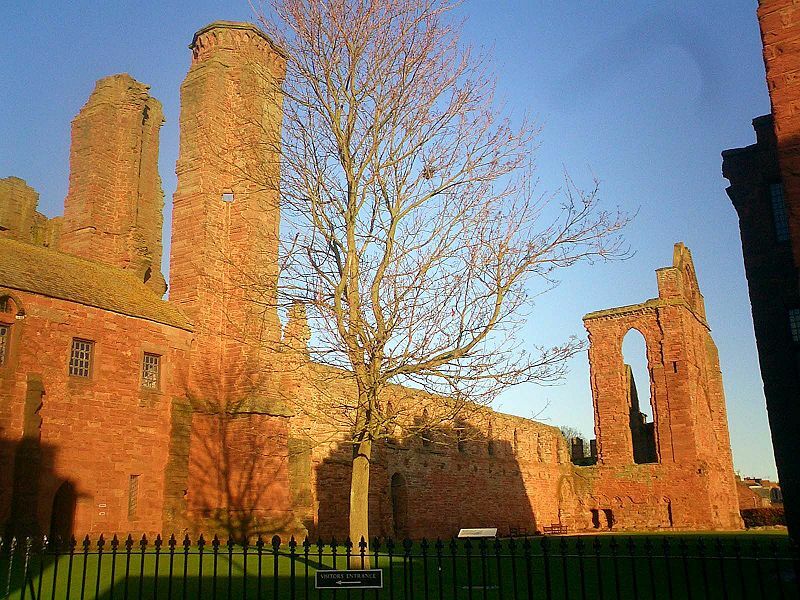 April 6, 1320 was the date of the signing of the Declaration of Arbroath in 1320 -- The Scottish Declaration of Independence. This week I transcribe a letter my grandfather, Martin Deutsch, received during the war from his sister-in-law, Frances. It was sent about a week prior to the letter I transcribed last week from his brother, Ted. April 1st means many things to many people. For some, it is April Fools Day. For some, it marks the beginning of the Baseball Season. For still others, it's the beginning of National Poetry Month. T.S. Eliot and Chaucer are the usual explanations given. 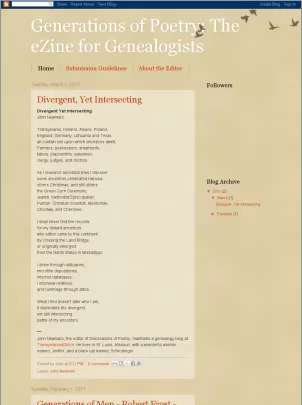 As I mentioned a few weeks ago, in honor of National Poetry Month this year, I have started a poetry ezine. The mission of the zine will be to share: poetry on the genealogy obsession (the research, the rewards, the pitfalls), as well as biographical poems about ancestors and kin. We will include poetry by famous authors (such as Robert Frost, who inspired the title of the zine with his poem, Generations of Men). We are also open for submissions from poets interested in genealogy, and genealogists with a hankering for poetry. There will be a poem-a-day during the month of April. I've already received enough submissions that this is guaranteed. And I am very pleased with the quality of poetry I have been receiving, and I hope others will be, too. The frequency of poetry after that will be completely dependent upon submissions. Interested poets should read the guidelines for submission.